Danai Gurira is leaving AMC's The Walking Dead. Gurira officially joined the cast during Season 3 and has been a fan-favorite ever since. The announcement of her departure strikes another massive blow to the hit series after Andrew Lincoln left late last year. Both of the Rick and Michonne characters are huge focusing points of Robert Kirkman's original source material, which the show is based on. For now, fans are anxious to see how the Whisperers factor into the future of The Walking Dead. 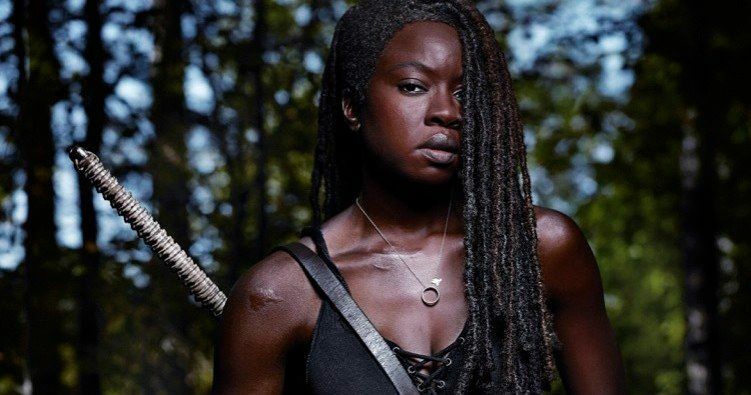 Danai Gurira will reportedly stay on board The Walking Dead Season 10, but in a limited capacity, which means that she will only be in a few episodes. Gurira will also star as Michonne in the three Walking Dead movies that AMC has planned for the Rick Grimes character. It seems that Gurira's departure has been in the works for quite a while. AMC programming president David Madden had this to say about the actress back in November. "She has been very vocal about saying that she loves the show. We love Danai; we love that character. Right now, she's got a lot of opportunities and she needs to weigh what she feels is best for her. But we certainly would want her on the show as long as she wants to be on it. We really want her to stay. She is an incredibly valuable character and I'm really hoping she stays. Obviously, the lesson of Andy is that the show can survive anybody's departure if need be but that's not our goal. The goal is to have Danai continue on whatever basis she can make work, given the other things that she has going on in her life." In addition to starring in The Walking Dead, Danai Gurira is an accomplished playwright and social activist. Her work on and off-Broadway have been hugely successful, with her play Eclipsed, which received a Tony nomination for best play. Eclipsed was also notable for an all-female and black cast and creative team, which was a Broadway-first. It's imagined that Gurira will spend more time on Broadway, writing and starring in projects, in addition to her continued work on The Walking Dead and future big screen projects. Speaking of the big screen, Danai Gurira is a part of the Marvel Cinematic Universe, having appeared in Black Panther and Infinity War. It is believed that she will also be present in the highly anticipated Avengers: Endgame, which hits theaters in April. Gurira has expertly used her time on The Walking Dead to launch a big screen career while being able to keep her Broadway roots intact. Danai Gurira and AMC have yet to comment on her departure from The Walking Dead, but they will more than likely release a statement soon. Gurira had reportedly been in talks with the network for a new contract since before The Walking Dead Season 9 started, since she was going to be doing a lot more heavy lifting. This is a developing story and more news is expected to drop soon. The Hollywood Reporter was the first to announce Danai Gurira's departure.